Welcome to the 43rd edition of the Carnival of Divided Government - The Special Last Carnival Before the Midterm Election Scary Halloween Edition. And what could be scarier than the Republicans back in majority control of Congress? Only one thing that I can think of... One Party Rule with either party in control of the executive and both legislative branches. That just creeps me out. Since we are now posting the carnival more frequently to keep up with the accelerating blogospheric activity on this topic, we changed the format to make pulling this together a bit easier. The focus is on more quantity and not too much commentary. The idea is to see how many quality Divided Government references we can list since last weeks carnival. As it turns out, I cannot resist weighing in with comment or two of my own. As explained in earlier editions, we have adopted Latin ordinal numeration to impart a patina of gravitas reflecting the historical importance of the series. In this the Carnival of Divided Government Tres et quadrâgintâ (XLIII), as in all of the CODGOV editions, we select volunteers and draftees from the blogosphere and main stream media writing on the single topic of government divided between the major parties (leaving it to the reader to sort out volunteers from draftees). Consistent with this topic, the primary criteria for acceptance in the carnival is to explicitly use the words and/or concept of "divided government" in submitted posts. A criteria that, to our endless befuddlement, is ignored by many of the bloggers submitting posts, which sadly results in The Dividist reluctantly ignoring their fine submissions. Among the on-topic posts, essays and articles we choose ten or so of our favorites for commentary and consideration. We hope you enjoy these selections. "With most pundits predicting a GOP takeover, cue the debate about whether a divided government will produce some much-needed compromise or grind things to a halt. In the New York Times op-ed pages today, David Brooks argues that “the road map for his recovery is pretty straightforward,” while Paul Krugman’s main takeaway is, “Be afraid. Be very afraid." To the surprise of no one, The Dividist weighed in on the increasing divided government debate, noting Krugman's absurd "partisan freakout", and "Defending Divided Government" against a new wave of attacks from lefty bloggers and academics. "...from a personal-experience point of view, a divided government appears to be better for the country. In my lifetime (and I’m 60 years old), the best times in a variety of ways were the 1980s and 1990s, decades in which shared power was more the rule than the exception. I remember vividly the first two years of the Clinton administration. One party was in control of both the executive and legislative branches and we had hideous legislation and laughable appointees (sort of a mild, relatively innocuous precursor to the past 21 months). 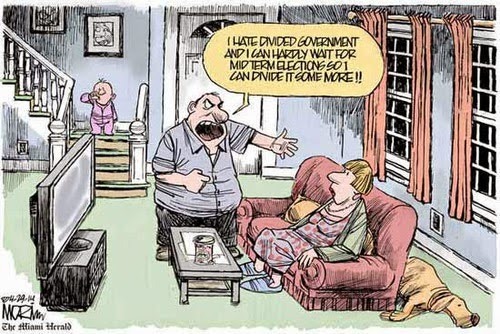 So, let’s have more divided government!" "Public choice suggests that Option 3 will not be chosen, by either President or by the GOP, because it offends against the principle of pandering to concentrated interests while offlaying the costs onto the dispersed general population. Sometimes, however, divided government succeeds where unified government cannot, in achieving welfare-enhancing outcomes." "And how should a divided government fare for the financial markets? Based on past performance, they would seem favourable... But if the chances of reduced government intervention in the economy are increased from a political gridlock, then the new political arrangement would likely boost business confidence, and thus becomes a positive influence, rather than undermine it. And only the politically blind and those addicted to unsustainable inflationary big government would see this as some fictitious horror tale. And as before, they will always miss out being right." "I voted for the Republican douchebag over the Democrat harpy. I’m not enamored of Paul Gosar, who has positioned himself as a social conservative in addition to his au courant, Tea Partyish support for free markets and smaller government, but incumbent Ann Kirkpatrick voted for the porculus bill and Obamacare, and that’s really all I need to know about her. 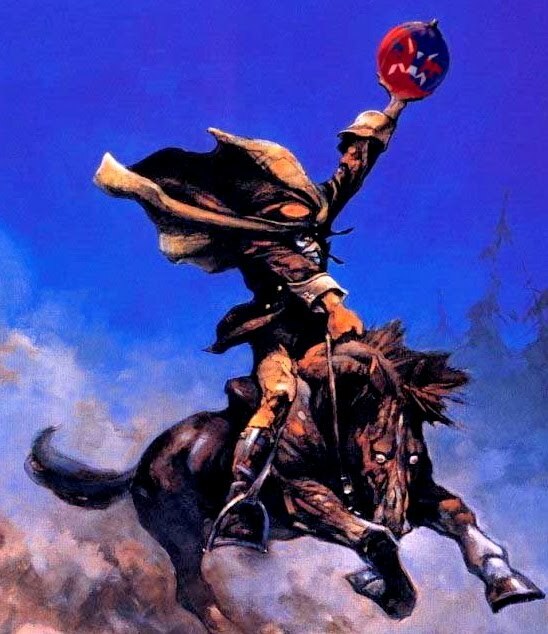 Basically, I voted for divided government that will occupy its time entertaining us with angry gridlock rather than hurrying us over the brink and into the abyss." Anne Kornblut writing at the Washington Post quotes Governor Bill Richardson of New Mexico who finds a silver lining for Democrats while noting "Obama may follow Clinton's model"
"...some Obama defenders say the president should look to the previous Democratic president as a model. "I do see a similarity to the Clinton experience," said Gov. Bill Richardson of New Mexico, a Democrat. "The divided government result, if it happens, is good for the president, because he now has some potential enemies but he also has some potential partners to get things done where he didn't have them before." Using the dreaded "t-word," Richardson said: "It gives President Obama a chance to triangulate on several issues of importance that he's going to need to get through the next two years." Still, divided government offers tightwads grounds for hope. The biggest one is historical. William Niskanen of the libertarian Cato Institute, who headed the president's Council of Economic Advisers under Ronald Reagan, notes that over the past 60 years, federal spending has risen least when one party occupied the White House and the other had control of at least one house of Congress. "I'm a fan of divided government and I really lost it with the Dems in the manner they rammed that bill through. So, having at least one house or both under the opposition's control is a good thing. HOWEVER, I have no faith that the Republicans will learn any lesson or be any different than they always are, new Tea Party candidates or not. I've always been disappointed when the other party seizes control and continues to be douchebags. No longer. Now I expect it. " Given the long list of items on President Obama's ostensible agenda -- such as climate change and immigration, to name only two -- his policy goals will likely be harder to accomplish under divided government. Congress will propose and possibly send him more bills that he opposes, and gridlock will often prevail." This post deserves a detailed response of it's own, and I may revisit this at some unspecified point in the future. But for now, a few points. Whether or not you agree with the conclusion in the title, it still begs the question of whether or not what is good for Obama is good for the country. Particularly since much of Side's argument revolve around the purely partisan political consideration of whether Obama's re-election chances are are enhanced or diminished with divided government. A careful reading reveals an almost tautological flavor to Side's argument against divided government. He starts with an unstated premise that legislation preferred to enable the activist liberal policy agenda of the Obama adminstration is in fact good legislation and good for America. This premise leads to a conclusion that gridlock is bad, because it prevents the President from getting the legislation he wants. Shock. If there is anything that should be clear from the precipitous decline of the Democrat's fortunes over the last two years, it is that most Americans disagree that the kind of legislation steamrolled by One Party Rule Democratic government is good legislation. In fact, not even Democrats or the President will stand up and say either Porkulus or Obamacare are good legislation. The best they'll say is something like "It's not perfect, but its the best we could do under the circumstances." Americans want better, or nothing. Blocking bad legislation is a positive benefit of Divided Government. Another problem with the Sides/Blinder thesis is that it rests on a contra-factual argument: Divided government is bad, he claims, because the legislation that passes under divided government is not as good as the quantity and quality of imaginary legislation that we would have gotten under the One Party Rule that did not exist at the time. Really. That is what he is saying. I'll also be very interested in seeing what Sides has to say about the virtues of divided government two years hence. I know what The Dividist will be saying. The Dividist will be supporting the re-election of Barack Obama (or perhaps a 3rd Party run by Mike Bloomberg), in order to head off the any possibility of One Party Republican Rule. I suspect that John sides will be singing from a different hymnbook in 2012, having rediscovered the benefits of divided government. Note to self: Bookmark this. 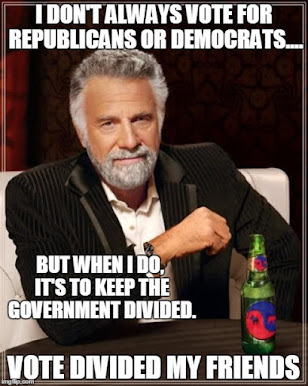 "American say they dislike divided government. They say it leads to political grandstanding leaving little time left to accomplish much else. Well, it is either they who say this, or the pundits who claim to spake for them. Each presidential election cycle, candidates bemoan Washington gridlock, and that gridlock creates policy paralysis. There’s two things wrong with these observations: 1) It is not clear that divided government creates gridlock, and 2) It’s not totally clear (historically speaking) when gridlock does exist, it is always, or even usually, a bad thing. Here are six examples to prove my point (many more could be added, of course, but these stand out as historical legislative accomplishments in a divided government). President George W. Bush and the Democratic controlled congress expanded healthcare laws to fund low-income and elderly citizens. President Bill Clinton and the Republican controlled congress overhauled the nation’s welfare system and balanced the federal budget. President George H.W. Bush and the Democratic controlled congress enacted far-reaching federal laws to aid disabled citizens. President Ronald Reagan and the Democratic controlled congress reformed the federal tax system. President Richard Nixon and the Democratic controlled congress create new programs for federal environmental policies and programs. President Dwight D. Eisenhower and the Democratic controlled congress established the interstate highway system. I have cited my own political science scholar (not in person of course) and he concluded that divided government do about as well as unified ones in passing important laws, conducting important investigations, and ratifying significant treaties. (Morris P. Fiorina, Divided Government, 1992, pp., 86-111). Political scientist David Mayhew studied 267 important laws that were passed during the time between 1946 and 1990. These important laws were just as likely to be passed when opposing parties controlled the White House and Congress. Divided government created the Marshall Plan and the 1986 Tax Reform Act." I hope Jason does not mind my taking such a large excerpt of his analysis. He is reading many of the same articles I do, and arriving at a similar conclusion. My only issue is with the tentative and defensive tone of his thoughtful post, generally ceding the high ground to those who would have us a believe that only One Party Democratic Rule has the wherewithal to govern effectively. I also take issue with the first sentence in this excerpt. I don't know who the Americans are that Jason is talking to, but the Americans I talk to have a very different preference. Having lived through One Party Rule for eight of the ten years, first by the GOP, and most recently by the Democrats, they are fed up with both parties and looking forward to a divided government keeping the worst impulses of both parties in check. "Is divided government what works — and what Americans want? Many recall the 1990s, with a Democrat in the White House and Republicans running Congress, with some nostalgia, as the two parties prevented either from undertaking massive initiatives, and the private economy grew. We saw welfare reform, a capital-gains tax reduction, free trade initiatives and a budget surplus. One scholar observed in a recent editorial board that when government is divided, the free market is a little more free, to the benefit of all. Divided government may neutralize the worst impulses of each party — Republicans are less apt to enact a pro-business agenda of subsidies and incentives, and Democrats are less likely to overregulate and micromanage." "The most astute commentators (such as Chicago’s Chapman) see that Americans are thrilled with neither party right now. (They liked the Republicans back in 1994.) But they seemed more attuned to the advantages of divided government–both (and studies back them up) as a means of controlling spending and as a way of containing the evildoing specific to each side. The most cynical or angry American voters (such as some who go to Tea Parties) think that Bush and his Republicans and Obama and his Democrats were/are both irresponsible screw ups. So let incompetence and corruption counteract incompetence and corruption (as FEDERALIST 51 sort of says). " "Gridlock is maybe what Republicans say they want, but the reality of governing requires cooperation and compromise. Both parties need to ignore their screaming commentariat on Fox and MSNBC and do the people’s business. If we do vote for divided government on Tuesday, the message we’ll be sending is that we expect legislation to be forged that recognizes We are not a liberal country or a conservative country. We are a centrist country, but one that has a strong libertarian tendency that’s been a hallmark of our republic since 1776. The Dividist agrees, and with that, we'll conclude this edition. Look for the next edition of The Carnival of Divided Government Quattuor et Quadrâgintâ (XLIV) - Special Post-Midterm Postmortem Edition - intended to be published next Sunday 11-07-10. Submit your blog article at carnival of divided government using our carnival submission form. Thanks for the link. And no I do not mind you sharing my post, in whatever form. I liked all the information you provided.